NEW YORK, — South Korean President Moon Jae-in and Chilean President Sebastian Pinera agreed Wednesday to further develop their countries’ bilateral relationship and also boost their trade by seeking to revise their free trade agreement. In a bilateral summit held here on the sidelines of the United Nations General Assembly, the leaders noted the South Korea-Chile FTA has greatly contributed to boosting the countries’ bilateral trade since it went into effect in 2004. 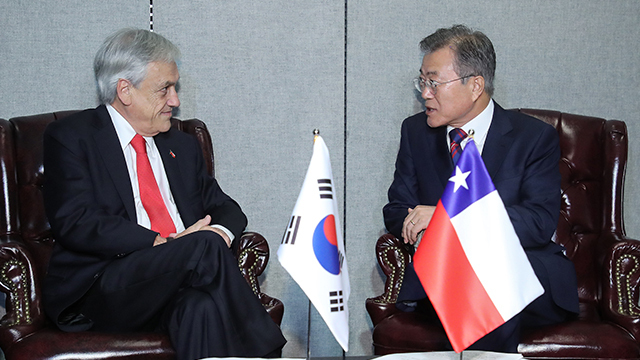 “The two leaders welcomed the progress made by the South Korea-Chile FTA over the past 15 years, and agreed to push for negotiations to improve the South Korea-Chile FTA that would upgrade the countries’ economic cooperation to the next level,” Moon’s presidential office, Cheong Wa Dae, said in a press release. Moon and Pinera also agreed to develop the countries’ comprehensive cooperative partnership and expand their cooperation in all areas. In particular, the leaders discussed ways to increase the countries’ cooperation in the infrastructure sector, according to Cheong Wa Dae. The leaders agreed to take joint efforts to realize South Korea’s membership in the Pacific Alliance, a regional forum founded by Chile, Colombia, Peru and Mexico in 2004. Moon also asked for Chile’s support for his country’s efforts to denuclearize the Korean Peninsula.